Are You Courting Disaster by Moving Overseas? I have friends back in the U.S. who still think I’m courting disaster living outside the country…even though I’ve been safely and happily doing so for 15 years now. “Aren’t you afraid of being killed or kidnapped?” they ask, as if everyplace outside the States is a war zone or a lawless, Wild-West backwater. These friends who still think I’m crazy for living “outside civilization” usually fall into two groups. The first group includes those who have never lived outside the States…and in many cases, never outside their home towns. Their viewpoint of the rest of the world comes via television, movies, and the internet. Naturally, they see the rest of the world—with the possible exception of any city featured in the last few James Bond movies—as one big, crumbling, explosive, Third World war zone or ghetto. The second group includes those of my friends who have spent some time abroad, but have done so in the military or on religious or governmental service missions. These folks have often actually been sent to crumbling, explosive, Third World war zones or ghettos, so these are naturally the places they commonly think of when they think of someone living outside the U.S.
Not surprisingly, the same misconceptions my U.S. friends have about the rest of the world are shared by my local friends abroad about the U.S. 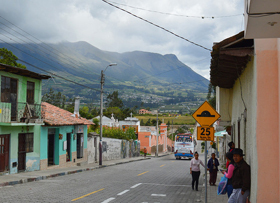 In most parts of the world (like Cotacachi, Ecuador pictured) you’re just as safe as you were back home. Not that they spend a lot of time thinking about the U.S. But when they do, they see it in terms of the latest news cycle, just like everyone else in the world. And what they see is, to them, a lawless Wild-West backwater where everyone carries a gun and shootouts and mass murders are a daily occurrence. From a statistical point of view, this too is a misconception. The actual intentional murder rate in the U.S. is fairly low, according to the latest data from The United Nations Office on Drugs and Crime (UNODC). The UNODC list ranks countries by the number of intentional homicides per 100,000 people, and the U.S. ranked 98th among the 218 countries where data was available. Why am I dwelling on all these murder rates and news cycles and misconceptions? Just to make the point that, despite what we’re shown on TV, in the movies, and on the internet, most of the world is pretty much the same. 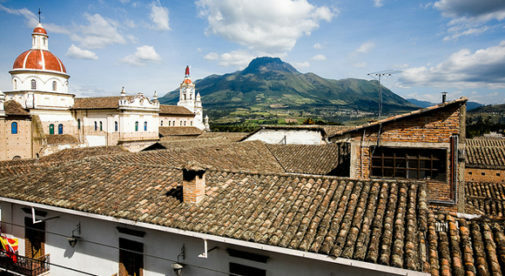 With the exception of a few notable hotspots that garner all the media attention, most of the world is made up of peaceful, pleasant places where people are living normal lives in the context of their culture and geography…including the U.S. and the many countries I’ve lived in and worked from for the past 15 years. This is a point I’d like to get across both to my U.S. friends and the local friends I have abroad. The world outside the U.S. isn’t one big, thief-ridden, Third World ghetto or exploding war zone. And the U.S. isn’t one big, lawless, gun-toting Wild West shootout. In reality, the world abounds with safe, comfortable, friendly places to live. Every year International Living publishes a long list of them (the annual Global Retirement Index), and the input for this list comes in great part from the first-hand experience of people actually living and working in those places. I and most other expats I know don’t live outside the U.S. because we’re crazy and like to court danger or because we’re afraid to live in the U.S.
We live outside the U.S. precisely because there are so many safe places where the weather is better, the scenery is more impressive, and the cost of living is cheaper than the places we lived back home. And the local people are friendly and welcoming. And also because it’s a huge adventure to live in and experience another culture and to see your own through new eyes. And if you could have a huge adventure, save money, have fun, and do it safely…why wouldn’t you?